Beautiful watches Omega Constellation, formerly belonging to the world of rock legend and roll Elvis Presley, will be put up for sale at Antiquorum auction in the category of Important and Modern Vintage Timepieces (Important vintage and modern watches. The auction will be held June 12, 2012 in New York. 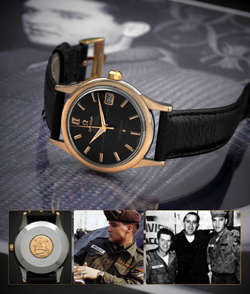 Omega Constellation watches with a black dial and calendar wrist adorned the king of rock ‘n roll, were presented to Charlie Hodge (Charlie Hodge) – longtime friend of Elvis and his trustee. Charlie Hodge played in a band of the great Elvis, and in 2007 was a talented musician honored at an official ceremony in the Museum Hall of Fame rock n ‘roll (Rock and Roll Hall of Fame). With the self-winding, center seconds hand, high water resistance, stainless steel chronograph buttons in pink gold watch with black face were released in about 1960. It is expected that the lot will be sold for $ 10,000 – $ 20,000, and the future owner will receive a gift chronometer confirming the authenticity of a letter signed by Hodge. Only a few copies of Haute Horlogerie, belonged to Elvis Presley, still reminiscent of the era. Elvis had a beautiful collection of watches from companies Hamilton and Rolex, Omega Constellation but the model holds a special place. “This is an important milestone in the history for fans and collectors of Elvis memorabilia hours” – said President and Chief Executive Officer of the auction. Watches Omega Constellation is one of the 269 models on the auction. Among the lots are such rare watches as Patek Philippe, Piaget, Ulysse Nardin and Jaeger-LeCoultre. Watches Patek Philippe Ref. 5016 in the case of 18K yellow gold with a gorgeous gray dial according to preliminary estimates will be sold for $ 450,000 – $ 650,000, and limited edition watches Jaeger Le-Coultre Gyrotourbillon platinum will go under the hammer for $ 250,000 – $ 350,000. The initial display of the collection will be held from 9 to 11 June in New York.